Wooden Pieces. Rosewood. king is 70mm or 2.75 inches, Cherry Box. Wooden Pieces. Rosewood. king is 70mm or 2.75 inches, Cherry Box.. Type: EQUIPMENT. Detail: WOOD_SETS. Product Code: WCM8B275. 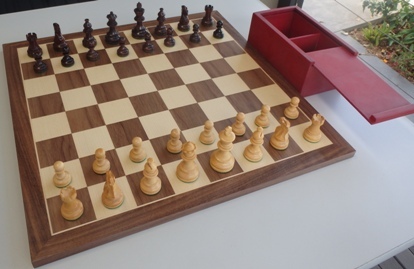 An elegant chess set made from rosewood. The king is the tallest piece at 7cm or 2.75 inches. It comes with a cherry box to neatly house the pieces after use. The walnut board (Product Code is NSP50450) is sold separately and is priced at $99. The chess set and board are usually sent by courier company and well wrapped.